We have not made progress because of the transmission losses between the poetry rooted knowing "what" and the plumbing focused knowing "how", writes Manish Sabharwal. 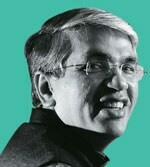 ABOUT: Someone who likes to discuss more about labour reforms in India than talk of the temping company he co-founded, Manish Sabharwal has a keen mind working at the intersect of demography, employability, and labour markets. A Wharton graduate, Sabharwal is the Co-founder and Chairman of Teamlease Services. In his earlier avatar, he started up, ran and sold India Life, a BPO firm in the HR space. A story about Albert Einstein has him giving an exam to his students. Fifteen minutes into the exam one of the students stands up and says, "We don't have a problem professor but the questions in this year's exam are exactly the same as that of last year." He smiles and says, "Don't worry, the answers are different this year." Unfortunately, the story does not apply to India's job creation emergency - here the questions and answers have stayed the same for the last 20 years. We have known what to do for a long time; the Apprenticeship Act of 1961 was amended last month, 39 years after Indira Gandhi made this reform the 20th point in her 20-point programme in 1975. We have not made progress because of the transmission losses between the poetry rooted knowing "what" and the plumbing focused knowing "how". India has a unique opportunity not only because of our young workforce - 65 per cent of our population is less than 35 years old - but also because China has crossed what Nobel laureate Arthur Lewis has identified as the turning point when a country runs out of farm labour and wages rise rapidly. This weakness of our primary competitor combines with the huge problems of developed countries. The sale of adult diapers has crossed baby diapers in Japan and Europe is facing an unsustainable situation: it has seven per cent of the world's population, 25 per cent of the world's Gross Domestic Product (GDP), and 50 per cent of the world's social spending. So the next 20 years are going to see India make a tryst with her destiny and this time she would like to keep. But for that, job creation should be at the heart of policy-making as jobs change lives in ways that no subsidy ever can. India needs massive formal, non-farm, private sector jobs. This objective needs to acknowledge that politics is a contact sport and policy is a child of politics. 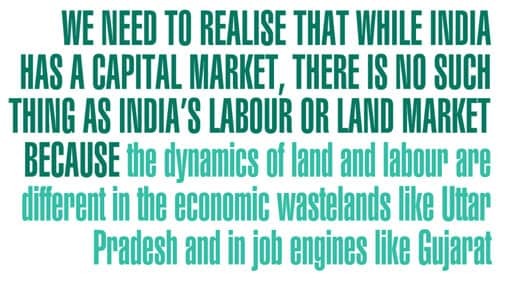 It needs to realise that while India has a capital market, there is no such thing as India's labour or land market because the dynamics of land and labour are different in the economic wastelands like Uttar Pradesh and in job engines like Gujarat, Maharashtra or Tamil Nadu. So empowering 20 Chief Ministers may be more important than fixing things in Delhi. India is a hostile habitat for entrepreneurship; we entrepreneurs have to generate our own power, provide transport, get our own security and find our own employees. But this policy hostility - outcome of commission and omission by the state - results in the two related birth defects of too few formal enterprises and too many sub-scale enterprises. India's 6.3 crore enterprises translate to only nine lakh companies. Of them, only 45,000 post at least one job on an online job portal on any day. Only 7,500 companies have a paid-up capital of more than Rs 10 crore. This massive inadequacy leads to sub-scale enterprises; 84 per cent of our manufacturing is done by companies with less than 50 employees. An enterprise can either remain a dwarf or grow from a baby. But India has become a nation of corporate dwarfs. Improving the ease-of-doing business across the board would increase formality, productivity and scale among our enterprises. Instead of Special Economic Zones, we need to fix the whole country by moving from deals to rules-based system, rebooting the Ministry of Micro, Small and Medium Enterprises, getting rid of the labour and tax-inspector raj, implementing Goods and Services Tax (GST), growing the venture capital industry, digitising government interfaces, freeing foreign investment, and getting rid of outdated laws. Taking jobs to people does not mean shoving more people into Delhi, Mumbai or Bangalore but creating new cities with a population of more than a million people (Currently India has only 50 while China has 400). Urbanisation is also not about well-planned economic wastelands like Chandigarh or regulatory arbitrage-created cities like Baddi, an industrial town in Solan, Himachal Pradesh. Urban reform is about governance decentralisation - 29 Chief Ministers are more important than one Prime Minister for urbanisation but the real solution lies in creating 100 real mayors. In 1924, Jawaharlal Nehru was the mayor of Allahabad; Rajendra Prasad was the mayor of Patna; C.R. Das was the mayor of Calcutta; and Vallabhbhai Patel was the mayor of Ahmedabad. There are wonderful letters of Nehru that talk about street lights and Patel about sanitation because mayoral elections were fought on issues like infrastructure. Unfortunately, the only real mayor in India is the Chief Minister of Delhi. If we provide the space for boldness in city governance, the agenda of low-cost urban rental housing, traffic, law and order, industrial clusters, drinking water, warehousing, toilets, and so on will see innovation. China's genius was competition among local leadership - the more local the unit of competition, the better. Only 12 per cent of India's workers are employed in manufacturing - this is the same as post-industrial US. This creates two birth defects for our labour markets: 50 per cent agricultural employment (half of our workforce produces only 15 per cent of GDP) and 50 per cent self-employment (most are subsistence and involuntary as the poor cannot afford to be unemployed). China became the workshop of the world because of great infrastructure, low wages and high foreign investment (60 per cent of their manufacturing exports come from multi-national companies using the country as a production base). But Chinese wages, in 10 years, have gone up from five per cent of the US wages to 20 per cent, and today Vietnam is the biggest beneficiary. The changes India needs do not involve a reversion to licence raj but making the whole of India a fertile habitat for all kinds and sizes of entrepreneurship. The productivity of individuals depends on their education and skills. In fact, school, vocational and higher education are much more closely related than what the current policy architecture believes. We can't teach somebody in six months what they should have learnt in 15 years. And we have many degree holders who can't get jobs. We need to replace the Right to Education Act with a Right to Learning Act. We also need new pathways for the 1.05 crore students who fail in Class 10 or and the 60 lakh students who fail in Class 12 every year. We need new kinds of universities that create academic modularity (mobility between certificates, diplomas, and associate degrees) and have flexible delivery (online, distance classroom, apprenticeships) because the social signaling value of a degree matters despite the bottom 25 per cent engineers getting less salary than the top 25 per cent Industrial Training Institute (ITI) graduates. We need to deregulate distance education because global Massive Open Online Courses like edX, coursera, udacity and so on cite India as one of their largest markets even as Indian universities are not allowed to compete nationally or innovate. We also need a radical revamp of our higher education regulator that currently confuses university buildings with building universities and a new medical education regulator to replace the one that has ensured a yearly output of 35,000 doctors, far less compared to 12 lakh engineers. Fixing the labour law regime allowed Germany to transform itself from being the sick man of Europe to the highest exporter of manufactured goods in the world. People who say that trade union laws don't matter don't understand the impact of Margaret Thatcher's changes in the UK during the 1980s. In fact, people who say that labour laws don't matter for job creation have never created jobs or tried to find one despite being qualified. India's labour laws are the corporate equivalent of marriage without divorce; on paper you can't get rid of an employee once your hire them. This need fixing in four areas - a benefits regime that confiscates 45 per cent of low-wage worker salary; a toxic trade union regime because of the politicisation of unions and the criminalisation of politics; regulatory cholesterol that is vague and contradictory, and an employment contract that is asymmetric. 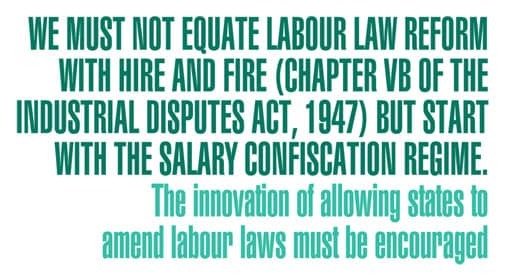 We must not equate labour law reform with hire and fire (Chapter VB of the Industrial Disputes Act, 1947) but start with the salary confiscation regime. The innovation of allowing states to amend labour laws must be encouraged because there is no such thing as India's labour market. In the next decade, for the first time in history, the world's poorest economies by per capita income will also be the world's largest economies. This is progress but India has a unique chance to raise its per capita income by accelerating job creation. When the father of the nation Mahatma Gandhi came back to India in 1915, Gopal Krishna Gokhale had asked him to make India proud of herself again. I would argue that restoring our pride is about making every young Indian educated, employed or employable. This should have happened a long time ago. But if not now, then when? And if not this government, then who?